December may be the month to assemble DVD lists and publish them, but if you’re someone like me who completely forgot to, then it’ll have to be January. I recorded scores for a number of DVDs that were released in 2018, plus a couple shorts posted on the National Film Preservation Foundation’s site. Here’s a list of them for you die-hard fans. The Marcel Perez Collection: Volume 2 (Undercrank Prods/Library of Congress) — another 9 rare comedy shorts starring and directed by silent comedy aficionado’s favorite new discovery Marcel Perez have turned up, and are on this DVD. Sourced from prints preserved by the Library of Congress, MoMA and the BFI, funded by fans through Kickstarter, and released on my label. Pioneers: First Women Filmmakers — Hypocrites and Sunshine Molly (Lois Weber); Caught in a Cabaret (Mabel Normand), Her Defiance and Eleanor’s Catch (Cleo Madison), Canned Harmony and The High Cost of Living (Alice Guy Blache). You can hear some of an alternate version of the Hypocrites score that I wound up not using on episode 28 of my Silent Film Music podcast. Found at “Mostly Lost”: vol 2 — four shorts in this collection of ten rarities: Snub Pollard in Do Me a Favor, as well as The Faithful Dog; or, True to the End, And the Villain Still Pursued Her; or, The Author’s Dream and vaudeville performance film Adolph Zink. A Model Husband (1916) — starring Harry Myers, who you may know as the drunk in City Lights — posted on the National Film Preservation Screening Room here. The Backyard (1918) — starring Jimmy Aubrey — posted on the National Film Preservation Screening Room here. Kidnapped: A Complete Night at the Movies (Movies Silently) — DVD of a 1917 feature and shorts package released as a complete program by the Edison company as part of its Conquest series. Dinty — Colleen Moore feature from 1920, Kickstarted by Ed Lorusso and DVDs sent to backers. The Kinetophone: A Fact! A Reality! (Undercrank Prods/Library of Congress) — I scored The Politician (1913), one of the surviving Kinetophone films whose cylinder soundtrack is still missing. The Alice Howell Collection — I’ve recorded scores for a dozen rare Alice Howell comedy shorts for the 2-disc DVD set I’m producing. Funded by 360 fans through Kickstarter and with prints sourced from the Library of Congress, EYE Filmmuseum, the British Film Institute, the Danish Film Institute, Lobster Films and the Blackhawk Films collection. The should be released sometime in late Spring 2019. 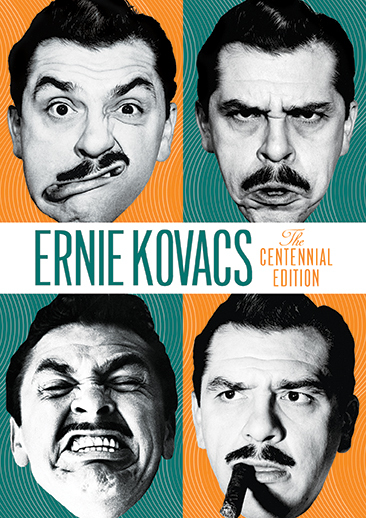 The Ernie Kovacs Centennial Collection — I didn’t record scores for this, but this 9-disc DVD set commemorating Kovacs’ 100th birthday (Jan 23, 2019) was released in November 2018. The box is basically the two Ernie Kovacs Collection box sets I put together for Ediad Productions and Shout Factory packed together at a special price. 22 hours of Ernie Kovacs shows from his earliest in 1951 to his last ABC special plus gobs of extras. No booklet inside, but the box is a pretty complete career retrospective.